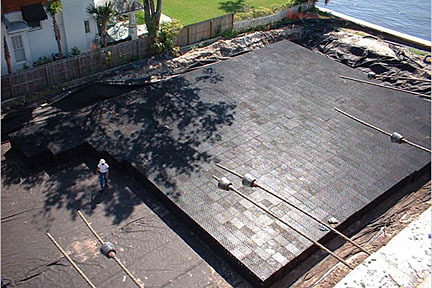 Layfield provides a number of products and services for storm water applications. Storm water systems can include run-off ponds and channels, underground storm storage systems, permeable paving materials, sediment control devices, and temporary coffer dams for flood control. Featured products for storm water include our underground storm storage tank system. These systems create a storm water pond underground so that the land area above can be retained for other uses. We are also featuring Geoblock grass paving systems, Aqua Dam flood control dams, and Enviro Liner geomembranes for storm water surface ponds. We also provide construction materials that can be used to prevent damage from storm water such as silt fences and other sediment control devices.